OMV has confirmed two gas condensate discoveries at the exploration wells Khouloud-1 and Benefsej-1 within the Nawara Production Concession located in southern Tunisia. These two additional discoveries are both commercially and strategically important, as they complete the previous success of the OMV drilling campaign with now nine discoveries in a row. The chance of making further commercially viable discoveries in the concession and the surrounding Jenein Sud exploration permit has therefore greatly increased. OMV and its partner ETAP, the Tunisian national oil company, have recently completed drilling activities at the Khouloud-1 and Benefsej-1 exploration wells in the Nawara Production Concession in southern Tunisia. This marks the successful completion of the 2009/2010 five well drilling campaign which aimed at proving the required resources for the Nawara Development Project. Khouloud-1 reached a total depth of 4,042 m, and Benefsej-1, the best well to date in the concession, was drilled down to 4,223 m. Both wells have discovered a combined total of over 60 m of net gas-condensate pay in the stacked sandstones of the Acacus and Tannezuft formations. Good quality sandstone reservoirs are now proven across the entire Nawara concession and this is encouraging for undrilled features. Gas-condensate was confirmed by an extensive and successful downhole measurement and sampling program. The wells have been cased and suspended for future testing and production. OMV and the Tunisian national oil company ETAP each hold a 50% interest in the Nawara Production Concession, 700 km south of the Tunisian capital Tunis. Studies are under way with respect to a possible development of the discoveries and the transportation of the gas to the Tunisian market. OMV first became active in Tunisia in the early 1970s. The acquisition of the international E&P activities of Preussag in 2003 gave OMV access to seven producing oil fields in the southeast of the country. The most prolific of these is the Ashtart field. OMV currently has interests in two exploration and six production licences in Tunisia. 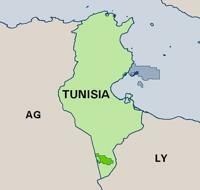 Its production in Tunisia amounted to approximately 7,000 boe/d in 2009. OMV operates the Jenein Sud exploration block which is situated in the Tunisian extension of the Ghadames basin. In April 2008, OMV acquired an 80% operated share in the Sidi Mansour exploration area.